Throughout our history of meeting clients’ print needs, James Printing has become many things to many people. We’ve served as innovators, consultants, communicators and problem-solvers. We are relationship builders who consistently put our clients first and put in 100% effort on every project. We are old-school in our belief that quality care and relentless commitment to outstanding print quality are essential principles of our reliability, yet we remain on the forefront of changing technology in the industry. Throughout our 44 years in business, James Printing has remained true to one mission: to help customers achieve their print and graphic arts goals while delivering an “extreme” level of customer service on each and every job. We pride ourselves on paying close attention to even the smallest details, regardless of a project’s run size or complexity, to ensure the finished print piece meets or exceeds expectations and delivers tangible business results. He believed that only by getting to know each customer’s unique needs could we help find ways to help them achieve their goals. That’s why we’re proud to have customer and vendor relationships established in our early years that continue to flourish today. Even as the printing industry changes and technology evolves, James Printing continues to grow by helping customers find new and innovative ways to grow their businesses. Our leadership team would like to thank the many employees, vendors, clients and friends who’ve supported James Printing in becoming Kansas City’s most trusted full-service printer. 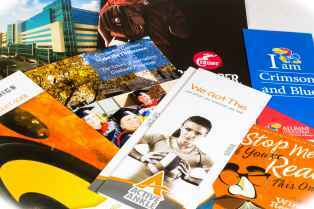 Ultimately, our goal is to deliver exceptional service and advanced print solutions for the best possible price. If you have questions or need assistance in making your next project a reality, our dedicated team of account execs, customer service reps, and printing and fulfillment experts can help. Contact Us today to experience the kind of loyalty and dedication to craftsmanship that your business deserves.